Family, Evening Primrose. Color, bright yellow. Calyx-tube, 4-lobed at top, narrow, much prolonged beyond the ovary. Petals, 4. Stamens, 8. Fruit, a 4-valved capsule. Leaves, alternate, long, narrow or oblong, pointed, the lowest on petioles. 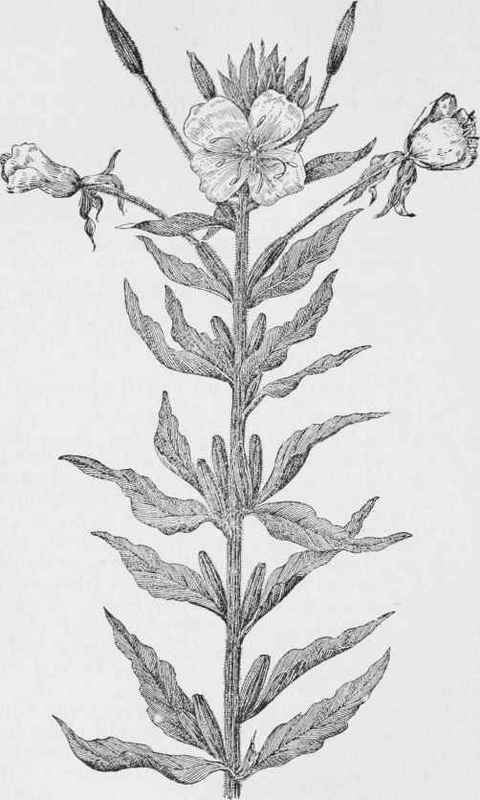 The evening primroses may be known by a long calyx-tube, at the end of which is the flower. The flowers are shortlived, and are followed by rough pods on the lower part of the spike. Hence, though a showy flower, generously brightening dry and dusty places, the aspect of the whole plant is coarse and unfinished. The flowers open at sunset and on cloudy days, and wither the next morning. In September they remain open all day.